all other parts. Sometimes, a visitor’s need comes first. When a visitor comes, a kind of immediate refreshment is offered to the him/her. This may be because they feel that the visitor has journeyed some distance and must be somehow tired. It is also because they want to show that they love you and appreciate your visiting. This first ‘kola’ can be in the form of drinking water as in Ghana, the visitor is first offered fresh, cold water before any other thing or discursion. This can be likened to that in the western countries where the practice is the offer of soft drink, coffee or tea. In Nigeria, especially the eastern part of the country, the people welcomes you first with the offer of kola nut. Sometimes this kola can be in the form of garden egg or bitter kola, in case there is no kola nut or the visitor doesn’t eat kola, but the primary thing is Kola nut. 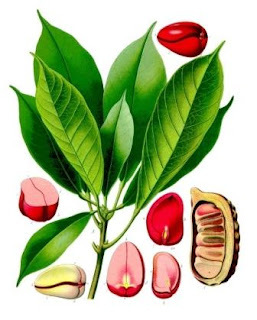 Kola nut is a caffeine-containing nut of evergreen trees of the genus Cola, it comes of various species like kola acuminate, kola atrophora, kola alba, kola nitida, etc. Cola acuminate is an evergreen tree of about 20 meters in height, and has long, ovoid leaves pointed at both the ends with a leathery texture. The trees have yellow flowers with purple spots, and star-shaped fruit. Inside a mature fruit, about a dozen round or square seeds can be found in a white seed shell. The nut’s aroma is sweet and rose-like. The first taste is bitter, but sweetens upon chewing. The tree reaches about 25 meters in height and is propagated through seeds. This Kola nut (Ọjị - as it is called in Igbo) occupies a unique position in the cultural life of Igbo people. It is also served before any important function begins, be it marriage ceremony, settlement of family disputes or entering into any type of agreement. It is said in an igbo proverb that “onye wetera oji, wetera ndu”, which translates to “he who brings kola, brings life.” The implication of kola nut presentation, therefore implies, establishment of love and trust. The Hausas of Nigeria also share the same love for kola, they are known to be the greatest consumers of kola nut. It is said that an average Hausa man’s coloured teeth is as a result of excessive consumption of kola nut. There is a common saying that during religious celebrations in the North like Sallah, instead of people asking for Sallah meat or food, they would rather say: “Ina Sallah Gworo?” meaning, where is my Sallah kola [Gworo is hausa name for kola nut]. One interesting thing is the unique way Kola nut is presented. The kola nut is presented to the visitors with ose-oji, which can be a paste made of ground fresh pepper and fresh red oil or ground groundnut with dry pepper. This is used to eat the kola nuts. When Oji is presented to the visitors, it is passed to the eldest person who pray over the kola nut, thanking god for the gift. Asking god to protect the host and his family, also asking god to guide and bless the eaters. The kola is then given to the youngest who will then break the kolas into small pieces and pass it round, starting from the eldest, for them to take and eat. This same kola nut is one of the things that has given the country, called Nigeria, a unifying image. Journeying from the eastern part of the country through the north to the southern and western parts, one unforgettable experience that the visitor takes away with him is the tradition of kola nut presentation. Yes! Then after kola nut, other foods like African salad [Iwu, abacha –Eastern Nigeria], Tuwon shinkafa, tuwon masara [northern Nigeria], and drinks like palm wine and burukutu can follow with the discourse or event of the day. This is because they want you satisfied before you leave.